The Rolla Roaster has changed camping for us! Coming out of Idaho, it only makes sense, camping is one of our main outdoor activities. 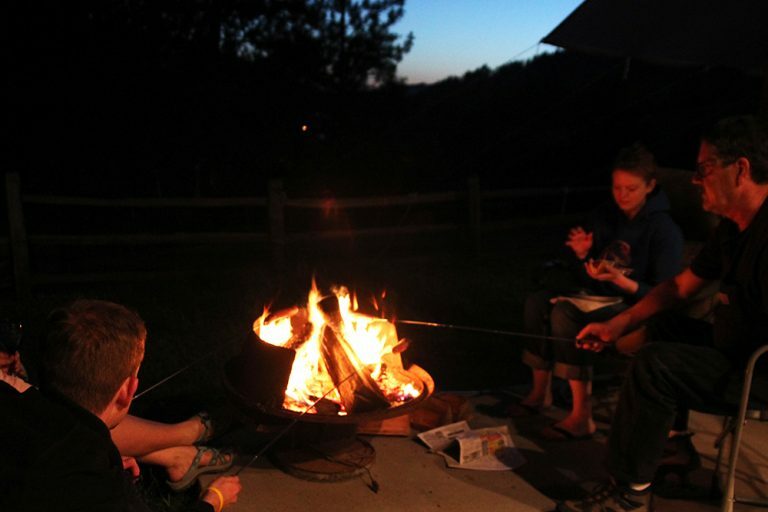 There is a saying “Life is good around the campfire.” Time spent just enjoying time with family and friends in the outdoors. So here is a brief history of how this all got started, over a campfire. A one armed inventor named Bob Holzer, moves to Idaho and soon the evening campfires in the front yard with his wife and friends is just the normal routine. Soon Bob has an idea to make something that roasts marshmallows and hot dogs over the fire with something other than sticks and the idea to have a camping fork that telescopes out. Then the work begins, he makes a few prototypes with TV antennas in his small shop beside their even smaller home located right along the Clearwater River. Soon the fork is welded on, the wooden handle added for heat resistance, and it is ready to telescope out and be tested. There was a bet made on how many could be sold before Christmas, his wife Jan bet him he couldn’t sell 100. Before you know it 500 roasters are sold and assembled by Bob in the small shop. There it is, the start of the business known as CMS Manufacturing. This was 30 years ago and still today when people learn about the Rolla Roaster, the ultimate marshmallow roasting stick, they are amazed and overjoyed and want all their friends to have one too! 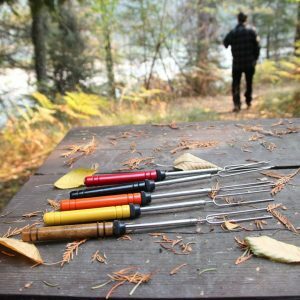 Bob didn’t see this small camping fork being a thriving business for this long, but due to the originality and practical use and just his perseverance and passion for his invention, CMS Manufacturing is still here and growing. We hope that all campers one day can say goodbye to searching for sticks in the woods, those can be saved for the kids to play with, build a fort or something. We hope that in the years to come families will come together around the campfire and all the cooking will be done on a Rolla Roaster! If you haven’t seen or heard of the Rolla Roaster yet check out the website, www.rollaroaster.com. It is the original telescoping camping fork, ideal for roasting marshmallows and hotdogs over the campfire. Enjoy camping!